The 4003S/SPC Blackstar was made for Mike Mesaro of The Smithereens. It is especially notable for its ebony black, maple fingerboard. Other features included dot fret markers, solid black knobs, reverse chrome and black hardware, chrome screws and raised letter name plate. The Blackstar might have been constructed to have been a reference to Rick James (!) but actually is from the name of a local rural canyon near the factory. 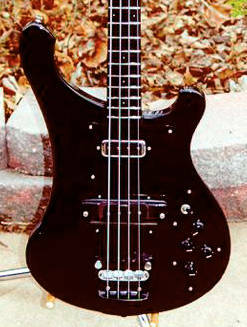 Only 200 of the Blackstar basses were made.